Halloween taper candles offer a fun way to enhance your Halloween décor. Candles are an essential part of decorating for the spooky holiday, and tapers come in a variety of styles and colors to suit the mood. One of the most popular varieties of taper candles for Halloween are those with characters on them. From witches to ghosts, these candles feature popular Halloween symbols made of wax and affixed or molded to the tapers. You can find these candles in a wide variety of colors and motifs. Taper candles made from wax that will pool and drip down the sides are also popular, as they evoke old-fashioned scenes from horror movies or mysteries. Cheap candles from the dollar store will usually serve this purpose, or you can spend a little more money at a specialty shop for candles that will drip. Always use these candles with a candle holder that will catch the excess wax before it lands on your tabletop. Here are some Halloween taper candles that you can purchase online. 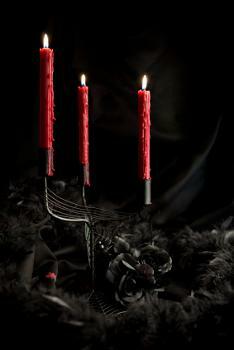 Bloody taper candles - These candles drip fake blood when they're lit. Black LED candles - Black flameless candles last forever as they run on batteries. Frankenstein character candles - These candles include the characters of Frankenstein and the Bride of Frankenstein. Spooky spider candles - These tapers feature spiders and webs along the length of each candle. Taper dinner candles - If you're looking for something simpler for a Halloween dinner party or formal occasion, or to decorate yourself, these plain colored candles will do the trick. It's easy to transform an existing taper candle into a Halloween taper. Here are a few ways to create your own homemade candle accents. Pumpkin candle holders - Pick up some of those tiny pumpkins and turn them into candle holders! Simply cut out a hole in the top of the pumpkin to hold the base of the candle. You can then carve or paint the pumpkin if you wish. Candle paints - Many craft stores and candle supply outlets carry candle paints. These are safe for use on candles that will be burned, and don't pose a safety hazard like regular paints would. For a simple design, paint spiders and spider webs on white taper candles with black candle paint. Beads - Adding beads to finished candles can create a nice effect. For Halloween tapers, try stringing orange and black beads in patterns. You could also use the beads to spell out short words like "Boo!" on the candles. If you can find Halloween themed beads, these would be perfect to decorate candles with. Place seasonal tapers in a candelabra and accent with Halloween decorations like artificial cobwebs and spiders. Just be careful to keep décor items away from the burning candles! Use them on table displays, in centerpieces, and in windows to create a spooky glow. If you end up with stubby taper ends after burning them, use these to light your Halloween carved pumpkins. Taper candles fit into any type of Halloween theme, from extravagant to simple. Use a variety of candles to set the mood, and always keep candle safety in mind.